Circulating tumor cells (CTCs) can be identified in approximately 25 % of stage I-III breast cancer patients; CTCs presence is a predictor of poor outcome in metastatic breast cancer, but little is known regarding the prognostic significance of CTCs in non-metastatic triple-negative breast cancer (TNBC) patients. The aim of this study was to determine whether CTCs predict worse outcome in non-metastatic TNBC patients. We evaluated CTCs in 113 patients with stages I-III TNBC at the time of definitive surgery. CTCs were assessed using the CellSearch System®. Progression-free and overall survival were defined as time elapsed between date of diagnosis and either date of clinical disease progression, death, or last follow-up. Log-rank test and Cox regression analysis were used to determine associations of CTCs with progression-free and overall survival. The median follow-up was 40 months. CTCs were identified in 23/113 (20 %) of patients. No primary tumor characteristic or lymph node status predicted the presence of CTCs. The identification of ≥2 CTCs predicted shorter progression-free (log rank P ≤ 0.001; hazard ratio 8.30, 95 % CI 2.61–26.37) and overall survival (log rank P = 0.0004; hazard ratio 7.19, 95 % CI 1.98–26.06) versus survival for patients with <2 CTCs. Two or more CTCs predict shorter progression-free and overall survival in TNBC patients. Larger studies are needed to determine whether CTC assessment provides beneficial information that could be used in stratifying TNBC patients at increased risk for disease progression. Finally, CTCs characterization could facilitate the development of novel treatment approaches for TNBC. Breast cancer, the most frequently diagnosed cancer and the leading cause of cancer deaths among women, is a heterogeneous disease that is classified and subtyped using clinical and pathologic features including patient age and tumor size, axillary node involvement, histologic grade, estrogen (ER) and progesterone (PR) hormone receptor status, and human epidermal growth factor receptor 2 (HER2) amplification. ER and/or PR receptors are expressed in a majority of breast cancers, and HER2 is amplified in approximately 20 % of cases . Triple-negative breast cancer (TNBC) is an aggressive phenotype comprising 10–20 % of all breast cancers . Triple-negative breast tumors lack ER, PR, and HER2 expression. Because of the absence of ER and HER2 expression and the aggressive nature of TNBC, effective management of TNBC patients remains a challenge in the clinic. Triple-negative patients are typically treated sequentially with a combination of chemotherapy, surgery, and radiation. These tumors respond favorably to neoadjuvant chemotherapy (NACT), and TNBC patients are more likely to achieve pathologic complete response (pCR) following completion of NACT than are breast cancer patients with non-triple-negative tumors [2, 3]. Although pCR predicted excellent survival regardless of tumor receptor status, TNBC patients with residual disease following NACT experience significantly shorter disease-free and overall survival than patients with non-triple-negative tumors and residual disease after NACT [4, 5, 6]. Overall, numerous published studies have shown that TNBC patients exhibit significantly shorter overall survival than do patients with other breast cancer subtypes, independent of clinicopatholigic characteristics such as tumor size/grade and lymph node status [2, 4, 6]. Interestingly, TNBC patients typically recur within the first 3 years following treatment [3, 4, 6] with a propensity toward visceral and cerebral (not bone or lymph node) metastases [7, 8]. Distant metastasis remains the primary cause of death for breast cancer patients. Historically, most clinical research efforts have focused on the prognostic significance of micrometastatic spread of cancer cells to lymph nodes; to date, lymph node positivity is the most powerful predictor of disease recurrence in patients with non-metastatic breast cancer. However, a significant number of patients with lymph node-negative disease recur, whereas almost a third of patients with lymph node-positive disease do not have a recurrence within 10 years following treatment [9, 10]. Over the past decade, improved enrichment and detection techniques have enabled clinical researchers to pursue studies to identify and determine the prognostic significance of occult micrometastatic cells within the blood [circulating tumor cells (CTCs) ]. Although the mechanisms mediating micrometastatic dissemination to the bloodstream are unknown, we know that these rare cells typically remain undetected by standard pathologic assessments and imaging technologies. CTCs are heterogeneous populations of cells with varying viability, dormancy, biomarker expression, and metastatic capabilities. This heterogeneity makes both detecting CTCs and determining their clinical importance a challenge. Originally, circulating tumor cell studies focused on identification and significance in the metastatic setting. However, since metastatic patients represent only a small percentage of breast cancer cases, many research groups are investigating the prognostic significance of CTCs in the non-metastatic setting. In theory, routine circulating tumor cell analyses have the potential of providing “real-time” assessments of occult micrometastatic dissemination and recurrence risk throughout treatment and during routine follow-up visits. The Cell Search System® (Janssen, Raritan, NJ) can detect as few as one CTC per 7.5 mL of peripheral blood and to date remains the only U.S. Food and Drug Administration-approved methodology for CTC detection in patients with metastatic breast, colorectal, and prostate cancers. Using this methodology, the presence of five or more CTCs per 7.5 mL blood prior to administration of systemic treatment has been shown to be an independent predictor of shortened progression-free and overall survival in metastatic breast cancer . Data are emerging regarding the predictive significance of CTCs in patients with non-metastatic breast cancer. Results from the French REMAGUS trial , the German SUCCESS-A trial , and a recent report from our group  indicate that the identification of one or more circulating tumor cell predicted progression-free and overall survival in patients with non-metastatic breast cancer. However, no data have been published about the prognostic significance of circulating tumor cell identification specifically in patients with non-metastatic TNBC. We hypothesized that the presence of CTCs would independently predict shorter progression-free and overall survival in patients with non-metastatic TNBC, regardless of axillary lymph node status or other primary tumor characteristics such as tumor size and grade. If circulating tumor cell presence was to add to the currently available prognostic information, this would help identify TNBC patients who remain at high risk for disease progression and death. To test our hypothesis, we evaluated CTCs in patients with stages I-III TNBC at the time of definitive surgery. This study included 113 patients with stages I-III TNBC who underwent surgery for their primary tumor between February 2005 and February 2012. All eligible TNBC patients with non-metastatic breast cancer seen by Drs. Lucci, Kuerer, and Bedrosian at The University of Texas MD Anderson Cancer Center were given an opportunity to enroll in this study. The institutional review board at The University of Texas MD Anderson Cancer Center approved this prospective study (04-0698; PI: A.L. ), which included circulating tumor cell assessment at a single time point just prior to primary surgery for breast cancer. Patients with bilateral breast cancer or any other malignancy within 5 years of diagnosis of the current cancer were ineligible for this study. We obtained informed written consent from all patients prior to blood collection. Enrollment was strictly voluntary; patients did not receive a stipend for participating. Individual patient results were blinded from investigators using a random number system as a unique patient identifier. TNM staging [primary tumor (T), regional nodes (N), distant metastases (M)] and tumor grade were designated according to the criteria of the American Joint Commission on Cancer (AJCC)  and Black’s nuclear grading system , respectively. Clinical stage was defined as the TNM stage determined at the time of the first diagnostic procedure confirming the invasive component of the tumor. Tumor sections were immunostained for ER, PR, and HER2 using previously published procedures . Primary breast tumors that expressed nuclear staining in ≥1 % of tumor cells were considered positive for ER and/or PR expression. Immunostaining results for HER2 were scored as positive when >10 % of the tumor cells had membranous staining or when fluorescence in situ hybridization (FISH) for HER2 gene amplification using the Abbott PathVysion HER2 DNA probe kit (Abbott Laboratories, Abbott Park, Ill) yielded a HER2/CEP17 ratio of >2.2. TNBC was defined by absence of ER and PR expression and the absence of HER-2 immunostaining and/or gene amplification in the primary tumor. Tumors were immunostained and considered Ki-67 positive when ≥35 % of tumor cells exhibited Ki-67 staining. Peripheral blood (7·5 mL) was collected at the time of primary tumor surgery but prior to any surgical manipulation of the primary tumor. Circulating tumor cell status was determined using the CellSearch System® (Janssen Diagnostics, LLC) within 72 h of blood collection. This semi-automated technology uses antibody-coated magnetic beads to enrich blood samples for cells expressing the epithelial-cell-adhesion molecule, labels the nuclei of these enriched cells with the fluorescent dye 4,2-diamidino-2-phenylindole dihydrochloride, and stains the enriched cells using a combination of CK 8,18,19, and CD45 fluorescent antibodies. A semi-automated fluorescence-based microscope system was employed to identify CTCs; nucleated cells were positive for CK and negative for CD45, as described previously . All results were reviewed by a qualified laboratory technician who was blinded to all patient data. Given the prognostic significance of one or more CTCs in patients with non-metastatic breast cancer, a cutoff of one or more CTCs was considered positive in this study. REMARK biomarker guidelines for reporting were used in the present study . We used Chi-square or Fisher’s exact tests to determine associations between presence of CTCs and primary tumor characteristics. Fisher’s exact test was applied when one or more cells with expected value was less than 5. Progression-free and overall survival were defined as time elapsed between date of diagnosis and either the date of clinical disease progression, death, or the last follow-up. Log-rank tests were used to detect significant differences between groups. Kaplan–Meier curves were derived using STATA/IC 11.2 software (StataCorp, College Station, TX) for comparison of groups defined by different circulating tumor cell counts. The Cox proportional hazards regression model was used to determine univariate hazard ratios for progression-free and overall survival. P values were two tailed, and values <0.05 were considered statistically significant. A total of 113 patients with TNBC were enrolled in this study, and their demographic data and characteristics are reported in Table 1. The mean patient age was 54 years, and median follow-up was 40 months. Thirty patients (27 %) had T1 stage tumors, 53 patients (53 %) had T2/T3, and 23 patients (21 %) had infiltration of the chest wall at the time of presentation. Fifty-one patients (45 %) had node-negative disease, 39 patients (35 %) had 1–3 positive lymph nodes, and 23 patients (20 %) had more than 3 positive lymph nodes at the time of surgery. Grade 3 disease was observed in 92 patients (81 %), and 58 patients (51 %) received NACT prior the time of blood draw for circulating tumor cell analysis. Seventy-one patients (63 %) had no CTCs, 23 patients (20 %) were positive for one or more CTCs, 6 patients (5 %) were positive for two or more CTCs, and 5 patients (4 %) had three or more CTCs (Tables 2, 3). Patients with one or more circulating tumor cell showed decreased progression-free survival than did patients with no CTCs using log-rank test (P = 0.002) and Cox proportional hazards analysis (hazard ratio = 3.93; 95 % confidence interval [CI], 1.55–9.94; P = 0.005). Nine (39 %) of twenty-three patients with one or more circulating tumor cell relapsed, compared to ten (13 %) of seventy-one patients with no CTCs. The progression-free survival proportion was much lower (61 %) in patients who had one or more CTCs than in patients who had no CTCs (84 %) (Fig. 1a). As the number of CTCs increased, so did the hazard ratios for disease progression. Patients with two or more CTCs showed decreased progression-free survival than did patients with less than two CTCs using log-rank test (P ≤ 0.0001) and Cox proportional hazards model analysis (hazard ratio = 8.30; 95 % CI, 2.61–26.37; P = 0.003). Four (67 %) of six patients who had two or more CTCs relapsed compared with fifteen (17 %) of eighty-eight patients who had less than two CTCs. The progression-free survival was much lower (33 %) in patients who had two or more CTCs than in patients who had less than two CTCs (81 %) (Fig. 1b). Patients with three or more CTCs showed decreased progression-free survival than did patients with less than three CTCs using log-rank test (P ≤ 0.0001) and Cox proportional hazards analysis (hazard ratio = 9.89; 95 % CI, 3.14–31.13; P = 0.001). Four (80 %) of five patients who had three or more CTCs relapsed compared with fifteen (17 %) of eighty-nine patients who had less than three CTCs. The progression-free survival proportion was much lower (20 %) in the patients who had three or more CTCs than in patients who had less than three CTCs (81 %) (Fig. 1c). No significant difference in overall survival was observed between patients with one or more circulating tumor cell and patients with no CTCs using log-rank test (P = 0.09) and Cox proportional hazards analysis (hazard ratio = 2.36; 95 % CI, 0.84–6.65; P = 0.12). Six (26 %) of twenty-three patients with one or more circulating tumor cell died compared with nine (13 %) of seventy-one patients with no CTCs. The overall survival proportion (70 %) in the patients who had one or more circulating tumor cell did not differ significantly from that in patients who had no CTCs (86 %) (Fig. 2a). However, a significant difference in overall survival proportion was observed between the patients who had two or more CTCs and the patients who had less than two CTCs using log-rank test (P = 0.0004) and Cox proportional hazards analysis (hazard ratio = 7.19; 95 % CI, 1.98–26.05; P = 0.01). Three (50 %) of six patients who had two or more CTCs died compared with twelve (14 %) of eighty-eight patients who had less than two CTCs. The overall survival proportion was much lower (30 %) in the patients who had two or more CTCs than in patients who had less than two CTCs (85 %) (Fig. 2b). Similarly, patients with three or more CTCs had lower overall survival rates than did patients with less than three CTCs using log-rank test (P = 0.0004) and Cox proportional hazards analysis (hazard ratio = 7.19; 95 % CI, 1.98–26.06; P = 0.01). Three (60 %) of five patients who had three or more CTCs died compared with twelve (13 %) of eighty-nine patients who had less than three CTCs. The overall survival proportion was much lower (30 %) in patients who had three or more CTCs than in patients who had less than three CTCs (85 %) (Fig. 2c). We identified no significant correlation between circulating tumor cell presence and pathologic axillary lymph node status. This lack of significant association persisted after we stratified lymph node-positive patients into those with one to three or more than three positive lymph nodes (P = 0.55). This is one of the first reports demonstrating that the identification of two or more CTCs independently predicted both progression-free interval and overall survival in non-metastatic triple-negative breast cancer patients. Previously published studies included a smaller number of triple-negative patients [11, 13] or did not assess the prognostic significance of CTCs specifically for the triple-negative subtype [13, 19]. In agreement with Kim et al. , we found that standard prognostic indicators such as >2 cm tumor size and high tumor grade (Grade 3) did not often predict outcome in TNBC patients. Although tumor size and grade were not significantly associated with circulating tumor cell presence, we found that the identification of two or more CTCs demonstrated hazard ratios as prognostically powerful as >3 lymph node metastases for both relapse and death. These data suggest that circulating tumor cell assessment might provide additional prognostic information that could be useful in identifying TNBC patients who are at increased risk for disease progression. We used the semi-automated CellSearch® platform for circulating tumor cell identification because it has been used in large clinical studies, it is standardized, and it is at present the only FDA-approved methodology for circulating tumor cell assessment (in metastatic breast, colorectal, and prostate cancer). Interestingly, one or more CTCs were identified in 20 % of our patient cohort even though a majority had early-stage (69 % had T1/T2 tumors) disease. The circulating tumor cell identification rate in this study is in agreement with the reported ranges (19–30 %) for patients with operable breast cancer in the GeparQuattro , REMAGUS 02 [12, 22], and SUCCESS-A trials , in a 2012 report by Franken et al. and in 2012 and 2010 reports from our group [14, 17]. To date, circulating tumor cell information has not been used in the clinic to stage or guide management decisions for non-metastatic breast cancer patients. However, data are emerging about the prognostic significance of circulating tumor cell identification. The REMAGUS 02 [11, 19], SUCCESS-A trial , and our published report  demonstrated that the presence of one or more CTCs is an independent predictor of both progression-free and overall survival in patients with stages I-III breast cancer. In all of these studies, neither hormone receptor expression nor HER2 amplification status of the primary tumor predicted the presence of CTCs. Yet, hazard ratios associated with progression-free and overall survival in the presence of one or more circulating tumor cell were greater than hazard ratios observed associated with tumor size and grade, and presence of one or more circulating tumor cell was as prognostically powerful as lymph node metastasis. 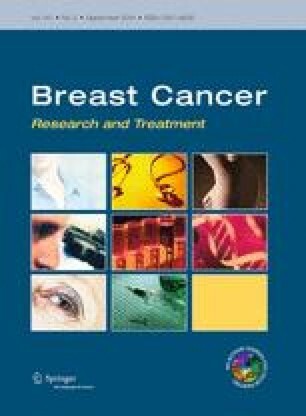 In the present study of patients with non-metastatic triple-negative breast cancer, the presence of one or more CTCs predicted shortened progression-free survival (mean progression-free interval, 12.3 months versus 27.7 months for patients with no circulating tumor cells, log-rank test P = 0.02). The effect of one or more circulating tumor cell on overall survival did not reach significance (log-rank P = 0.09), but the hazard ratio of 2.36 suggests a positive association. The lack of statistical significance is likely due to the small sample size, the low number of events, and the 40-month follow-up period used in the present study. We are continuing patient follow-up on our current protocol and are enrolling new TNBC patients to determine whether one or more circulating tumor cell predicted overall survival. In this study, blood samples were obtained for circulating tumor cell analysis at the time of primary surgery, just before surgical resection. Just over half of the patients received NACT prior to circulating tumor cell assessment. We found no differences (P = 0.61) in circulating tumor cell identification rates between patients who were chemo-naive and those who received NACT prior to circulating tumor cell analysis. These results are in agreement with several published reports demonstrating that CTCs can be identified in a significant number of patients following systemic neoadjuvant and adjuvant treatments regardless of the types of therapies employed. After neoadjuvant therapy, CTCs have been identified in 27–60 % of patients using polymerase chain reaction (PCR)-based methodologies [23, 24, 25, 26, 27] and in 18–49 % of patients using immunocytochemical methods [12, 13, 22, 28]. In all of these studies, the identification of CTCs after therapy predicted worse outcome. It is not surprising that CTCs are often identified in patients following cytotoxic therapies that targeted dividing cells, as CTCs have been reported to be dormant . In addition, recent reports by Gazzaniga et al. have demonstrated that CTCs express multi-drug resistance proteins (MRPs) [30, 31]. Circulating tumor cell MRP expression independently predicted resistance to chemotherapy, and CTC MRP expression in metastatic breast cancer patients was associated with shortened progression-free survival. Therapies directed against biomarkers expressed in the primary tumor might also be ineffective against CTCs. For example, numerous recent reports indicate that HER2-positive CTCs can be identified in a significant number of patients with HER2 HER2-negative primary tumors [32, 33, 34, 35, 36, 37]. Since therapy management is usually based solely upon primary tumor characteristics, these patients are not typically offered anti-HER2 therapies. Given the aggressive nature of triple-negative breast cancer and the limited targeted therapy options available for these patients, circulating tumor cell identification and characterization are particularly important. Circulating tumor cell profiling might expedite the development of novel therapeutic agents that would benefit triple-negative patients who are at high risk for disease recurrence. In the present study, the presence of one or more circulating tumor cell significantly predicted progression-free survival for patients with TNBC regardless of the presenting clinical stage of the disease. Although not statistically significant, the hazard ratio associated with one or more circulating tumor cell was as prognostically powerful as was >2 cm primary tumor size and the presence of 1–3 lymph node metastases. Larger clinical studies are needed to determine the prognostic significance of one or more circulating tumor cell in triple-negative patients. In conjunction with ongoing research and published work, this study provides important insight into the prognostic significance of CTCs and establishes circulating tumor cell identification as an important research tool for future clinical studies investigating the development of therapeutic options for triple-negative patients. This work was supported by The Society of Surgical Oncology Clinical Investigator Award (A Lucci), by The Institute for Personalized Therapy at The University of Texas MD Anderson Cancer Center, and by and philanthropic funds.